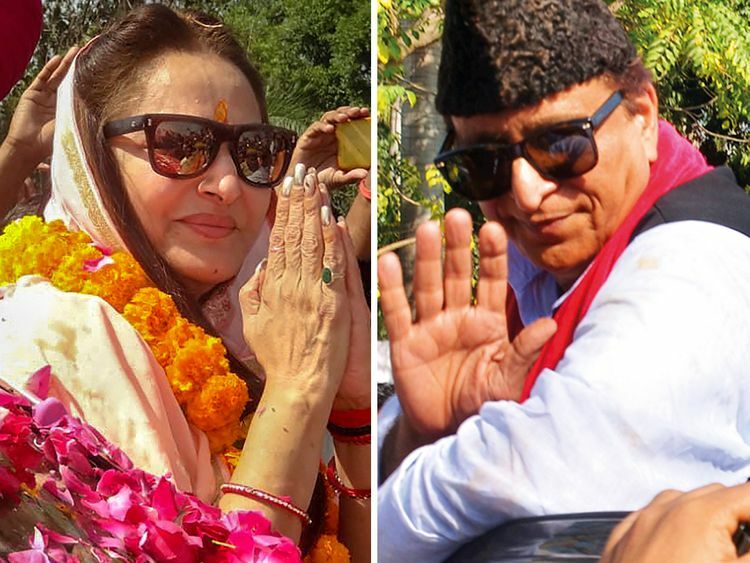 Lucknow: An FIR has been lodged against Samajwadi Party leader Azam Khan in Rampur for making objectionable remarks against actor-turned-politician Jaya Prada who is contesting the Lok Sabha elections on a BJP ticket. The reference to Draupadi added fuel to tfire and Khan’s supporters claimed that it was the Union Minister who had insulted Prada by comparing her to the Hindu mythological character. The National Commission of Women (NCW) has issued a notice to Khan. Barnali Shome, NCW under-secretary, said the commission strongly condemns such irresponsible and disparaging remarks. Meanwhile, a visibly upset Prada said on Tuesday that Khan should not be allowed to contest elections after making such remarks. Khan, on the other hand, denied having taken the name of Prada while making the statement. “Not even once did I take her name. One particular channel did mischief and added the lady’s name. I have the original recording and I am willing to face any court on the matter. The media should also behave responsibly while reporting facts,” he said on phone. Meanwhile, Khan stoked a fresh controversy on Monday when he asked people not to be afraid of officials.